January | 2015 | Mike Lamberti, From Margate To Cleveland, And Back ! The news hit with the subtlety of a sledge-hammer. Karen Purcell passed away on Jan. 30. She left behind her husband, and three wonderful children. Rhyme nor reason needn’t apply here. Karen was just 53. She and her husband, Tim, have seen their fraternal twin daughters, Eileen and Jamie, excel in college, both as students and athletes, and most importantly, as responsible young adults. The Purcells’ son, Michael, a sports encyclopedia, outstanding golfer and as nice a young man as they come, is in high school. Karen and Tim never asked for accolades as they raised their children. They just did their job. 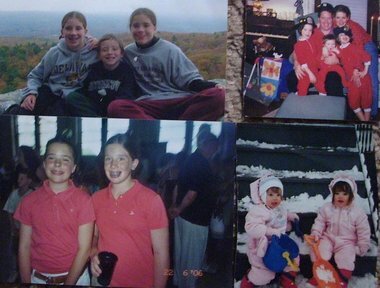 The Purcell family, through the years. When Eileen and Jamie were ready to start high school, their parents had a tough decision to make. While the family resided in Nutley, there was a thought of sending both to Mount St. Dominic Academy, a private all-girls school in Caldwell. Eileen was an up and coming star at shortstop, Jamie a stud catcher, when they started high school in the fall of 2008. Both were above-average students. Eileen opted to attend Nutley High, Jamie decided MSDA would be the place for her. Karen Purcell, a woman whose smile defined her exterior, and I would become friends while her daughters were in high school. As graduation neared for her girls in 2012, she took some time to reflect on what it was like to have them at different high schools. (Left to Right) Karen Purcell, Jamie, Eileen and Tim Purcell following a Nutley at Mount St. Dominic Academy softball game in late May of 2012. It was Eileen’s final high school game after a marvelous career at shortstop at Nutley High School. 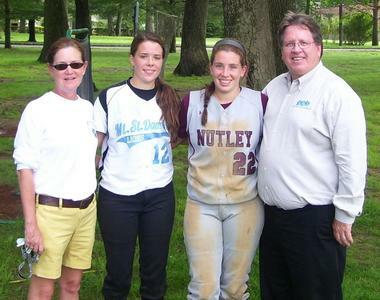 “Looking back, Tim and I couldn’t be happier with the way things went,” Karen told me on the day MSDA played Nutley in what would be Eileen’s final high school game, in late May of 2012. With the girls at different schools and playing softball on usually the same day and time, Karen and Tim would alternate which game they’d attend. On the occasion when MSD and Nutley would play each other, the itinerary was easy. In 2011, Nutley and Mount St. Dominic played for the Essex County championship at Ivy Hill Park in Newark. Nutley won, 3-0. Afterward, a noticeably emotional Tim reflected on watching his daughters play against each other. To paraphrase, he hated it, because like any parent, he didn’t want to see a child be disappointed. As they grew up in high school, Eileen and Jamie turned from shy to well-rounded young adults, with sparking personalities. If it’s true that the apple never falls far from the tree, and thanks to some caring and attentive parenting, Karen and Tim’s children are doing well. Karen Purcell was a loving wife and mother. She would stay close to her daughters, but wanted them to thrive on their own, as well. In the craziness of the high school softball circuit and the hundreds of games in the fall, summer and spring, Karen often knew the score when it came to coaches and college scouts, but she wanted her daughters to learn that process, as well. After the twins graduated, Karen, Tim and I stayed friendly. Karen did some work at a prestigious country club in Union County and she and I had the chance to speak during an event at that club last year. Of course, most of the conversation revolved around how her kids were doing in college. Karen and I had just met up about 10 days ago. She told me that Eileen was heading back to school (at Central Connecticut State) after the holiday break, while Jamie would be home a few more days before going back to The College of New Jersey. Both girls are juniors and playing softball on the collegiate level. To try to comprehend Karen’s passing will be impossible. God has chosen to welcome her home, and there’s no questioning that. Tim, Jamie, Eileen and Michael, along with a host of family and friends, will need to grieve in their own way. We can only hope that they will be buoyed by the support, love and friendship of those closest to them. I will miss Karen’s very dry sense of humor, that sly smile and directness. You always knew where you stood with her, and for that, I’ll always be grateful. That says all you need to know about the quality of the Purcells. Karen’s legacy will live on with her children, and somewhere, Karen is flashing that smile once again. That was 20 years ago. Today, DiPiano (Big D to his friends) is beginning the 64th year of his life. What changed the course for this man? 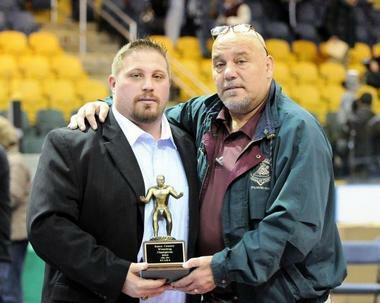 DiPiano’s new lease on life will be recounted at the fifth annual Gift of Life Wrestling Duals, set for this Saturday at Northern Valley-Demarest High School. 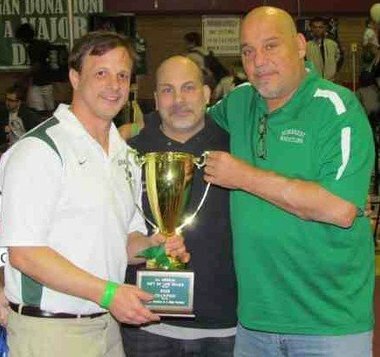 With a wrestling theme of ‘Organ Donation is a Major Decision’ as a backdrop, there will be eight teams competing, including the host school, Demarest, which is coached by DiPiano’s eldest son, Mike, Nutley, coached by youngest son Frank, along with Delbarton of Morris Township, Garfield, Montville, Bergenfield, St. Benedict’s and Robbinsville. Mike DiPiano and youngest son, Frank, after Nutley won the 2012 Essex County Tournament championship for the first time in school history. Frank is Nutley’s head coach, and has since led Nutley to three straight District 14 championships, as well. Wrestling begins at 9:30 a.m. with the finals set for approximately 3 p.m. This is the second year that the Duals will be held at Demarest, after being contested at Nutley High since the inception in 2011. DiPiano’s association with St. Benedict’s Preparatory School in Newark is legendary. As the wrestling coach there, he amassed a record of 274-89, and was named the state’s Coach of the Year by the Star-Ledger in 1987. He is a member of the St. Benedict’s Hall of Fame, as well as the USA Wrestling Hall of Fame in Stillwater, Oklahoma. After coaching at St. Benedict’s, DiPiano became the school’s athletic director. Now retired as the A.D., he remains associated with St. Benedict’s. 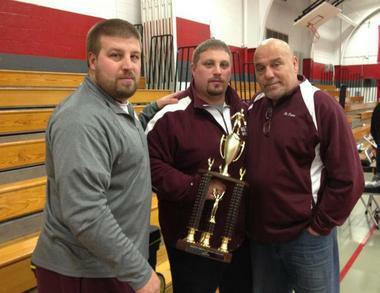 Mike DiPiano Sr. along with sons and current wrestling coaches Michael (left) and Frank. “I just hope I can meet his mom one day and tell her that.” Mike DiPiano, Sr., hosts a Christmas party every year at St. Barnabas Medical Center in Livingston for children who have had, or will be receiving, an organ transplant. He’s here with his reliable ‘Elves’. John Engel’s legacy will be easy to define. He was an honest, hard-working man, as loyal as they came, with a dry sense of humor, and a legendary scowl. In the banking business, he demanded excellence, and when it was attained, he rewarded it. As a husband, father and eventual grandfather, he was the proverbial putty in the hands of those who loved him most. 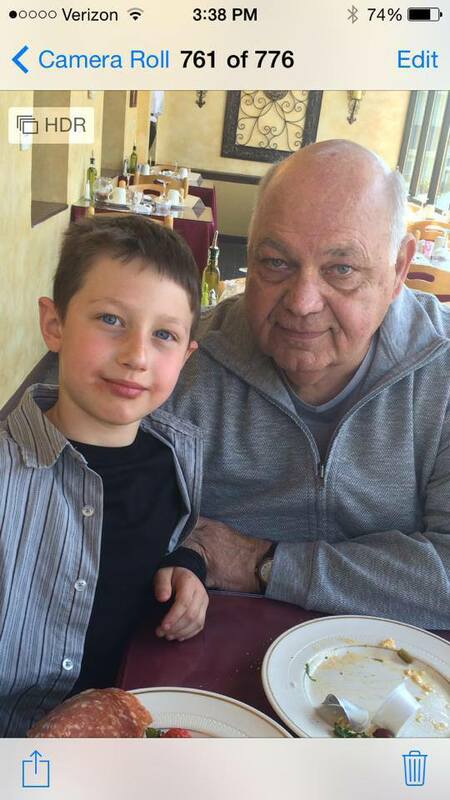 John was called home on Jan. 6, after a long and courageous battle with an illness. As he worked to stay in good health, through rounds of treatment, he never complained, other than to say he was tired on certain days. He wanted to enjoy as much time as possible with his wife, Jan, and the couple’s daughters, and the grandchildren. It was just recently that John and Jan had purchased a beautiful new home in Teaneck, and John couldn’t wait to move in. John and I went back a while. I first met him in 1982, when I was a newcomer to the banking business. We both worked at National Community Bank of New Jersey. He was a branch manager at the time, at an office in Carlstadt. I was a management trainee who was assigned to work in his office for a few days. Eventually, John moved up to the rank of Vice President and Regional Administrator in what was referred to as ‘Region 3’ at NCB, which encompassed northern Bergen County, including Teaneck, where John lived, Englewood, Hackensack, South Hackensack, Ridgefield, Edgewater and Norwood. John was a natural for that RA role, which required a strong background in branch operations. He was never the guy who enjoyed making the business calls on prospective customers, but loved to delve into the guts of banking, making sure all the branches he was assigned to administer were towing the line. In 1986, I was named a branch manager in John’s region, and for the next eight years, we became pretty good friends. He would always be on my case about something, making sure my office in Ridgefield, and later in Englewood, was following strict procedures. John taught me the importance of diligence, of following up and never thinking I was too good at my job. He and our Senior Officer, Mike Ferrara, ran a fun region. Mike was the ultimate businessman, always looking to make a good commercial loan while John was the guy making sure the money we made on loans wasn’t slipping out the back door in the form of poor auditing control. I eventually became a Vice President at NCB, through Mike and John’s guidance, and will tell you those were wonderful times to be in the business.I remember those legendary barbeques at John’s house on Memorial Day weekend. John loved car racing and usually the barbecue was on the day of the Indianapolis 500. So, John would use the VCR to tape the race, and made sure none of us would tell him who won before he could watch it that night. When NCB was purchased by the Bank of New York in 1993, John’s administrative duties moved him onto a new bank, where I eventually joined him at the Trust Co. of New Jersey. We would also work together at a bank in Union, NJ. John eventually retired from banking a few years back, and I’m happy to say we remained good friends. We would have dinner once a month, for a while, and he had that same crazy, dry sense of humor. We’d reminisce about the people we worked with during the NCB days and kid about the fact that he detested flying in an airplane. When we worked together at NCB, and I went on a vacation to California, he’s often kid me to take flight insurance and name him as the beneficiary. 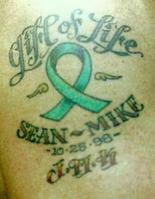 When he was diagnosed with an illness last year, he called me to say he was optimistic about his future. We would e-mail each other regularly, and I kept telling him I would love to stop by and have some pizza with him, just to catch up. He said we would, but unfortunately, that didn’t happen. On Jan. 7, his wife Jan sent me a note to give her a call. I had a feeling it wasn’t going to be an enjoyable call, but when she said he had died the night before, it still hit home. There are people who leave an indelible impression on one’s life, simply by being a good man. John Engel was such a person. He did what a man is supposed to do, and wanted no fanfare in return. In true John Engel fashion, his last e-mail to me, on Dec. 17, 2014, was one of his usual crazy political messages, which always drew a laugh, or two. Thank you, John, for being a friend and teaching much more than what it took to succeed in business. I’ll miss those crazy e-mails with a political overtone that we both agreed on, and I’ll miss not having those dinners with you.